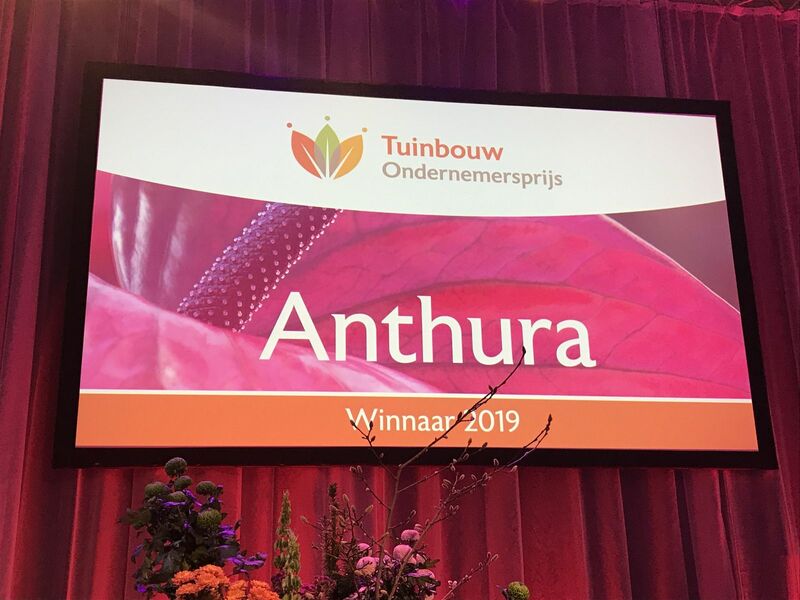 Anthura won the Horticultural Entrepreneur Award 2019 in January. According to the jury, the breeding and propagation company of Anthuriums and Orchids has gained a strong international position in an impressive way. Sustainability and good employment practices are high on the agenda. The Horticultural Entrepreneur Award, a work of art made of metal and over 1.5 metres high, is a prominent item at the counter. "We took it home immediately and are allowed to keep it. It’s easy to lift. We'll take the artwork with us when we start taking pictures," says Marco van Herk cheerfully. Your company looks beyond breeding and propagation? This pioneering attitude was praised by the jury of the Horticultural Entrepreneur Award. Are you doing more in that area? The jury stated that you have a lot of knowledge and craftsmanship that helps to further innovate and develop the sector. Do you agree? Do you fancy the ambassadorial role for the horticultural sector that you get as an award winner? “The issues of sales, innovation and sustainability are still subject to various challenges. During the celebration of Anthura's 80th anniversary, we discussed this with stakeholders from various companies. There were some good, substantive discussions at the table. Now it is time to get on with it. If we do nothing, then nothing will happen. “It is becoming increasingly important. We are therefore involved in the FSI chain project, which aims to achieve a minimum of 90% of trade in sustainably produced flowers and plants by 2020. As a company, we invest in geothermal energy, solar panels, energy and CO₂ from OCAP (out of control action plan), among other things. Sustainability is not always purely business. A good example is our role in a project concerning an orchid that is threatened in the Swiss Alps. We helped with its propagation and replanting in the wild. We received the Plantum Sustainability Award for that project in 2018. What challenges do you see in terms of sales? To what extent can you help growers? “First of all, by developing better, more sustainable varieties. We can also help in the development of cultivation and sales in the Netherlands. This can be crop-wide and specifically per cultivar, market or company. But our sales are also abroad. So exports. We see China as the main growth market for our crops. The number of wealthy Chinese is growing by 40 million annually. There are already 450 million of them. Anthura has production locations in the Netherlands, Germany, China and Macedonia and supplies more than 70 countries with young plants. The tissue culture of the young plants takes place in China and Macedonia. We work mainly with local staff at our international locations, because we assume that there are good people in every country,” explains the director. “We are looking at how we can cement employees’ loyalty to our company. Consultations often take place via Skype, but we also believe it is important to meet each other regularly in real life,” says Iwan van der Knaap. In 2018, the company celebrated its 80th anniversary. A festive year, with the icing on the cake being the Horticultural Entrepreneur Award in early 2019.